Let’s face it; becoming a successful hotelier isn’t always a walk in the park. There’s more to it than most people think. In this article, I have discussed a few of the personality traits that are specific to hoteliers. This post further elaborates on hospitality traits that can give a competitive edge to all hoteliers. I have further discussed in this article a few more personality traits that can make you more employable and loved at the workplace. A good hotelier is a Democrat, a diplomat, an acrobat, an autocrat, and a doormat, all wrapped in one. There’s some truth in the saying, but being top-notch and a winning hotelier takes more than luck. The above image might look too academic and what I have done in this post is to have these jargons broken down to suit the hospitality industry. A recent study has shown that top hoteliers tend to possess these big five personality traits. Read on; you will be glad you did. In this personality trait list for top hoteliers, visionary come as a priority. Think in the line of thinking outside the box. Visionary hoteliers don’t shy away from “what if” questions. They want to know if a new technology will shape the hotel industry. They want to know if a new research by Oxford makes sense in today’s hospital industry. Even if it means stretching out of comfort zone, a visionary hotelier is willing to risk short-term to reap long-term. They keep themselves updated with the hospitality industry trends and look to improve all the time. One of the key personality traits that need to be inculcated to be a top hotelier is the ability to be decisive. Top hoteliers can make decisions in a snap. That doesn’t mean their decisions aren’t informed. They have the innate ability to think on their feet and present practical decisions on the fly. More often than not, being a visionary and decisive is the right mix to make calculated business risks. They don’t ever meddle with the problem; they act and they typically have an alternative plan. Now, this is the most important of the Big Five personality traits for hoteliers. Hospitality is about people and service people. This doesn’t imply that is just pleasant and always smiling. It means that they actually love people and fancy working with them. And they are dead right on the spot. Thus, among the big five personality traits of an excellent hotelier, being a people’s person trumps all. In fact, a study by a leading Oxford research centre has established that customers aren’t satisfied with what you can do for them, but by the fact that you actually care. Here are a few more tips to become a great hotelier. Managing a hotel isn’t exactly climbing Mt. Everest, but having a multitasking trait will certainly tide things over in your hotel. Here’s the fact about being a hotelier: there’s no duty in managing a hotel that isn’t part of your job description. It is important to know a bit of everything to be one of the best in the hotel industry. Top hoteliers command respect from other employees. There’s no question about that, but they must also have team building traits. They are the esprit de corps that inspire hotel crew to work in harmony – and efficiently. This trait is more of being a good leader than anything else. The Hotel industry is one of the very few industries which has an immaculate gender balance. Women leaders play an important role in shaping the hospitality world. The ladies of today through their attitude and personality traits have broken the ‘glass ceiling’ that existed in some industries and societies. The image below displays key personality traits of women leader in hospitality and other industries. 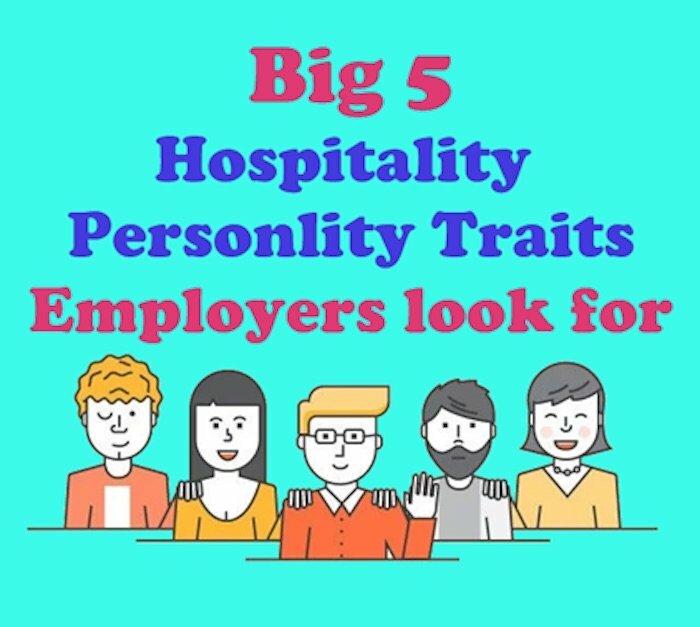 Apart from the big 5 personality traits of the hoteliers mentioned above, there are a few more personality traits that can help in coming out with flying colours during the interview or while at work. Along with the personality traits mentioned above that are customised around the hotel industry, there are a few other traits that make an individual unique and valuable. We live in a world in which our career has turned out to be our sheer identity. It is not just about means to pay our utility bills but to essentially discover our spot in this fast-paced world. It’s here where personality traits come into play. It is crucial to Emancipate Yourself from Mental slavery. While choosing a career it is very important to be content and fulfilled with its results. Apart from that, there are few significant points to be noted while appearing for an interview or deciding about a career. Integrity – A character that is essential for everyone who wishes to climb the ladder of success. Integrity is all about being oneself, but it is not as simple as it seems. Attaining Integrity is a challenging character as it drives one to be loyal, truthful and meek. To be precise, it holds forth an idealistic nature. A person with integrity is respected and loved by all. Ambitious – To be ambitious is to be ready to seize that dream job and do everything possible to do it well. In simple words, you must be a go-getter. Most employers want candidates who are shrewd and determined. We definitely do not want an aimless fellow walking around with no intention of helping himself or the company. An ambitious person is strong-minded and holds the key to unlock success. Reliable – In a workspace, there is one goal and it is important to be able to work together to get the desired goals. When it matters to stand together, it also matters to be reliable. Hence if you do not have that as a sharp feature, then it is better that you start working on it as it is one of the key personality traits that define workers and the workplace. Allow people to rely on you, as it is satisfying and it will definitely boost your career. Take responsibility and try to help even when the project doesn’t seem to be your cup of tea. In a nutshell, be a reliable team player. Creative – Being creative is again a bonus to your profile. It is indeed the most important personality trait in today’s world. The good thing is, being creative takes some effort but it is not impossible. Creativity always varies depending on the field. It can be an idea or designs or maybe words that help the innovation process. Wherever you are, creativity matters, it determines your ability to think critically. Positive attitude– Positive attitude is a strength for the team, and it is definitely what most interviewers look out for in terms of personality traits. It is this attitude that can allow a person and the team to make things happen. During an interview, cynical remarks or appearing to be negative can turn your assessment curve downwards. Stress is something that can cripple people of their work life but a positive attitude fights against such pressure and all other obstacles. However, make sure that you don’t mistake being positive to jabbering. Answering questions can be more specific and a positive tone to it will always be taken well. If you belong to the hospitality world this link of Hospitality questions with answers might be helpful. Confidence – Confidence is an essential nature but must be in the right amount. A little ahead, and overconfidence can wear you down. A little behind it and you will simply fail. It is one of the key personality traits that employer look for. Confidence in you is always important. If you do not believe in yourself then why would they risk it? Most of these personality traits are qualities that are essential and easily attainable ones, but at the same time, they are not castles in the air. Apart from all of this, it always matters to hold knowledge of the firm with an enthusiasm that will satisfy the interviewers. So what’s going to be your unique selling point in the interview of your dream job? Think in terms of the big five personality traits of hoteliers and the 6 subtle personality traits. If you have these cultivated within, there is no stopping you for sure. Manish Jha is the Cofounder of Global Hospitality Portal (SOEG). A Hospitality professional with over 10 years of industry experience. He is a believer in compassionate leadership and co-creation. It is through this philosophy, that he aims to create a robust hospitality platform created for and by hospitality professionals.